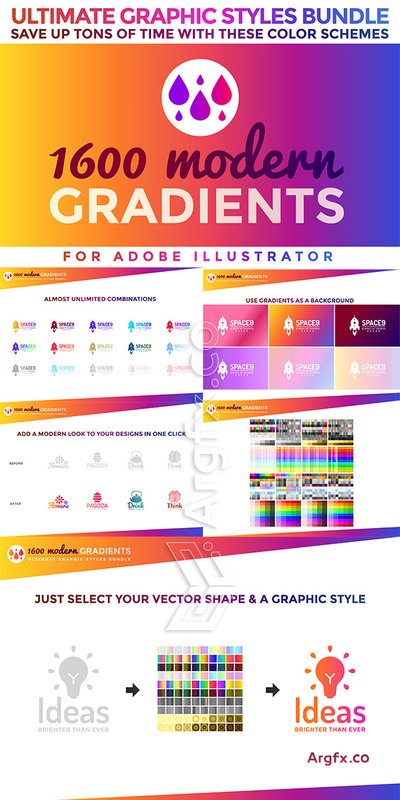 1600 GRADIENTS: ULTIMATE GRAPHIC STYLES BUNDLE This ultimate bundle includes predesigned gradient schemes as graphic styles, also text, square and icon samples. Give a modern look to your artwork with no effort, just click and find your favourite color scheme in our gradients graphic styles collection. Fonts used are available for free in Google fonts (Montserrat and Pacifico). Ready to be used in Adobe Illustrator. Add a unique look to your logos, icons, texts, graphics... with just one click! INCLUDED: AI + PSD + EPS + PDF + JPG + PNG. • Also you can open "Gradients-GraphicStyles-Illustrator-SquareSamples.ai" and copy the styles from the squares. • Use them in your logos, icons or corporate templates. • Complete and improve your artwork in just a moment. • Give a professional look to your brand or product and gain more clients. Young Coconut comes with uppercase, lowercase, numerals, punctuations and so many variations on each characters include opentype alternates, common ligatures and also additional swash to let you customise your designs.This script comes with two type, the regular and inline.This font is suitable to use as a logotype, apparel, wedding invitation, signboard, sport club, motor / car, etc. • All are fully Vector.